HOW To FIX ERROR B200 Canon IP2770 Series - Good day my friend printerdriverscenter.info all, this time we will share to you all about how to troubleshoot error B200 on Canon IP2770 printer. If you are a user of this printer and is currently having trouble with error message B200 then you are very lucky once can get lost is the right place. Here I will share tips on how to cope with it. If you are interested then I suggest to read this my article in its entirety, let you easily in practice later. When we want to use the printer to print a document suddenly pops up error messages on the screen monitor us with writing a message B200 ERROR such as the image below. ERROR B200 because OVER HEAD, how to know the B200 due to an OVER HEAD by turning off the printer, the printer cover off top, we turn on the printer and then we will see whether or not the cartridges move house if it turns out not moving means due to the OVER HEAD. How to resolve this problem by removing the cartridges and we attach a used cartridges/other, when it's a new normal we return the cartridges last us off. ERROR B200 due to less stable Voltage Power supply voltage mensuplay to the Mainboard. How to cope with a new Power Supply. B200 ERROR due to a faulty Mainboard and it had a lot going on, this error mainboard is usually caused due to a faulty component. The experience of the printerdriverscenter.info component which is often damaged it is the resistor with the code in the mainboard R301. How to troubleshoot Search resistors with R301 and replace with a new one. under this section the mainboard is damaged the printer doctor circle with an arrow pointing upwards. 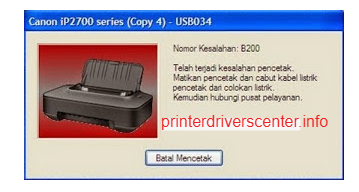 so that all the article HOW To FIX ERROR B200 Canon IP2770 Series from printerdriverscenter.info hopefully can provide benefits on you all, and finally good luck good luck. Thank you've read articles from us, please share the article if you think the article is useful for all netizens.